With our warm weather, crisp evening skies and nightly symphonies of Cicadas, it’s difficult to find a South African who does not enjoy being in the outdoors. 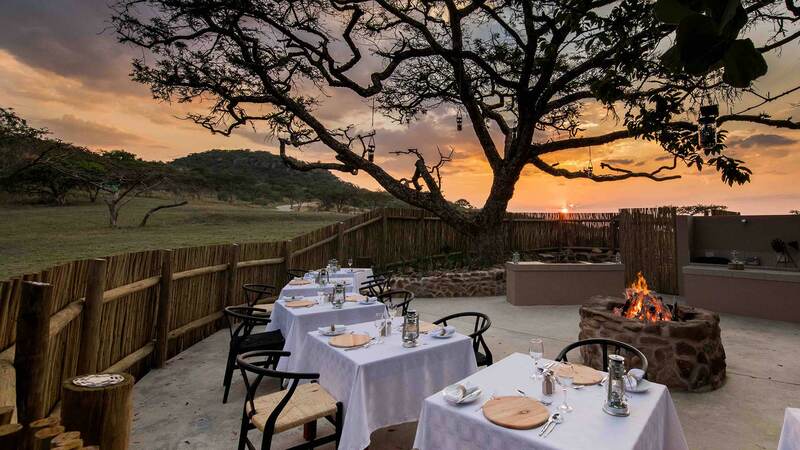 On some summer or even warmer winter evenings, guests can experience an African “la dolce vita” with an Al Fresco dining experience in one of our boma area. Our chefs put on a show as they prepare dinner on an open flame “braai”, the salivating aromas of the food mingling with the crackle of burning wood. After dinner entertainment is provided in the form of “bush TV” – large bonfires which provide an ambiance which is uniquely African. Flames leap up towards the brilliant black skies which showcase the Milky Way. The sound of shared laughter around the fire mingles with the call of a nocturnal creature and the gentle clinks of the ice cubes against the side of the glass containing your nightcap. The fading embers eventually signal bedtime as you breathe in the stillness of the bushveld. This is the Africa you’ve dreamt about. And this magical evening will forever be part of your soul.